Why is zulily Called zulily? First comes love, then comes marriage, then comes the family-focused online startup… right? Well, maybe not for everyone. But that’s certainly the way it went for zulily founders Darrell Cavens and Mark Vadon. It was 2010 in Seattle, Washington and the technology startup scene was already growing into the massive industry we know now. At the time, Mark Vadon himself was well-versed in launching companies, having founded Blue Nile in 1999. This was where the two began their work together, until Darrell Cavens left for Microsoft after almost nine years. Then they became fathers, and as with most new fathers, their view of the world changed. They began accompanying their wives to buy things they probably didn’t know existed previously. Shifting their focus from tech to Tyco gave the new dads a new outlook on shopping. The change in perspective led Vadon and Cavens to what they saw as a void in the market, and they founded zulily in the hopes of filling it. To do so, the site partners with brands to offer moms deals on all of their favorite finds while saving them the hassles of the brick-and-mortar stores. New items are added every day, often at a discount of up to 70% off, and all a new user has to do is sign up and start shopping. Once an order is placed, the item gets shipped to zulily before it gets sent to the shopper’s door. Why is it called zulily? Maintaining a devout devotion to moms and their children has been – and still is – a core value for the zulily brand. When the startup was in its infancy, Cavens and Vadon did what many entrepreneurs do. They turned to the experts and hired Chris Johnson, a Seattle naming consultant and author of The Name Inspector, to help dress up their newborn idea. Of his meetings with Cavens, Johnson said, “The goal was to come up with a distinctive name that was playful but not cutesy-one that had a kind of ‘boutique’ quality that would appeal to fashion-conscious moms.” So they brainstormed. “We brainstormed lists of words that would appeal to kids and words that would appeal to moms,” he remembered, “On the kids’ list there were lots of animal-related words, including ‘zoo’. On the moms’ list there was ‘lily’, along with some other flower names.” Eventually the word morphed from Zoolily into zulily, simply for a more subtle and compact design. SEE ALSO: Why is it Called Zappos? 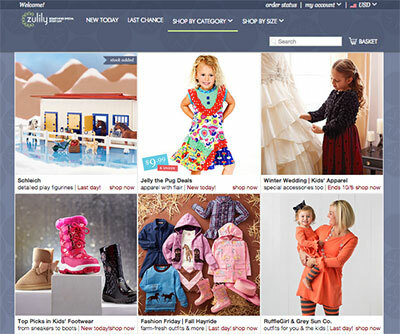 Some might even argue that the unique moniker set the site up for success, as zulily quickly outgrew offices and distribution centers in order to publish more than 1,400 products per day by 2012. zulily IPO’d in November 2013 at $22/share, quickly climbed to $41.31, and later closed at $37.70/share on the first day of trading. Fast forward a couple years to August 2015, when Liberty Interactive‘s QVC division acquired zulily for $2.6 billion.